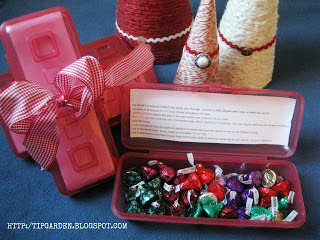 This weeks Thrifty Gift Idea: these cute containers or treat bags filled with chocolate kisses with a holiday poem attached.They are the perfect super easy, no stress gift tfor giving away to teachers, co-workers, neighbors, or sunday school classes. Back in August during back to school sales I picked up these small pencil cases for less than 50 cents each, in anticipation of using them for filling with cute holiday treats to give away. I attached a poem that I have had in my files for years, with a little tweaking of my own. Feel free to tweak the poem yourself to suit your own needs! Or need a non-religious poem? see my alternate poems at the bottom of the post for ideas! Do you want to make a lot of small treats? The world is in need of “KISSES” the whole year through. So here’s a little sampler with notes on what you can do. 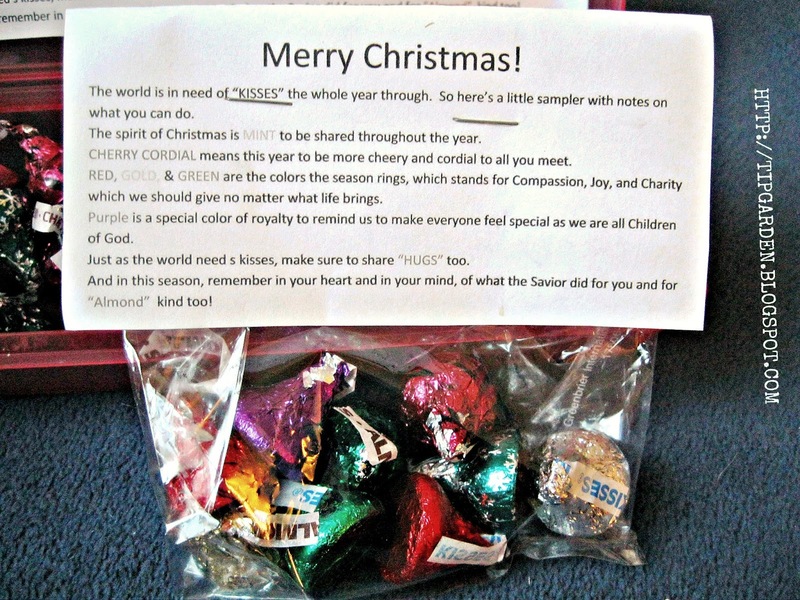 The spirit of Christmas is MINT to be shared throughout the year. CHERRY CORDIAL means this year to be more cheery and cordial to all you meet. RED, GOLD, & GREEN are the colors the season rings, which stands for Compassion, Joy, and Charity which we should give no matter what life brings. Purple is a special color of royalty to remind us to make everyone feel special as we are all Children of God. Just as the world needs kisses, make sure to share “HUGS” too. And in this season, remember in your heart and in your mind, of what the Savior did for you and for “Almond” kind too! Want to use a different poem? Here are some really cute ones from craftsayings.com. There are a TON more than I'm posting here for all kinds of occasions so save that site for future reference! To share some Christmas glee! To every girl and boy! With every girl and boy. And not be left behind. Is about God's only son. And I thought you could use some of these angel kisses. cheer you up and make you smile when you're feeling blue. and suddenly everything will become crystal clear. and soon you'll feel a sense of warmth and happiness.